There is a car park located behind the shop with a 15 minutes free period. Lorna Davies Florist is your local florist in Perth and the surrounding areas. We offer you the best quality fresh flowers with a personal, professional and friendly service. We also stock a beautiful selection of giftware and fashionable accessories for the home. in creating both traditional and contemporary designs for corporate events, weddings, funerals and special occasions. Lorna Davies is a proud winner of the Winner of the Lantra Modern Apprentice of the Year in 2003. We offer national and international deliveries. Winner of the Lantra land-based modern apprentice 2003, Lorna opened the doors to Lorna Davies Florist in October 2003. 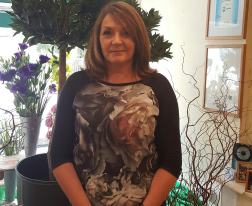 With a background in retail and, in particular visual merchandising, Lorna has a passion for floristry. 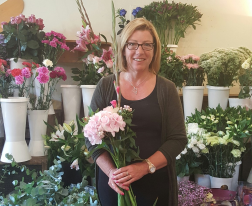 With a wealth of experience at her fingertips, Lorna loves her job and likes nothing better than to use her skills to create floral designs tailor made to each individual requirement. Lynn joined Lorna Davies Florist in March 2005 as Lorna's business partner. Coming from a retail/office background she manages the day to day running of the shop.